Among the most noteworthy additions on the table of contents is feminist Kate Chopin, who was revolutionary in her time for depicting women who hungered for an independent life outside of the confines of marriage and children and who sought out their own sexual fulfillment. Included within this anthology are “Story of an Hour” and the two connected stories: “At the Cadian Ball” and “The Storm.” “The Storm” was particularly groundbreaking; written in 1894, it presents a woman who, in the throes of lust, commits adultery during a violent thunderstorm. Due to the sexual explicitness of the story, it was never published until 1969, over seventy years after Chopin originally wrote it. Continuing along the same vein are works by Dorothy Parker (“Big Blonde”) and Edna St. Vincent Millay (“First Fig,” “Second Fig,” and “What My Lips Have Kissed”). Both writers also portrayed women who expressed sexualities that challenged societal mores, although this specific story by Parker displays a woman who becomes trapped by the limited role she is left to carry out in society. Even with multiple English degrees under my belt, I found there to be many stories and writers within the anthology I had not read, or even heard of. Among the writers whose legacy has been somewhat left to obscurity is Alice Bradley Sheldon, who posed as a man and wrote under the pen name James Tiptree, Jr. in order to better her chances of publication. Tiptree, who once belonged to the CIA, wrote compelling science fiction works. The included selection, “The Last Flight of Dr. Ain,” reflects both her background in the CIA and the knowledge she gained through her Doctorate degree in experimental psychology. Also included within this collection (and one could not imagine any anthology of women in literature not including them) are a selection of poems from Anne Sexton, Sylvia Plath, and Adrienne Rich. 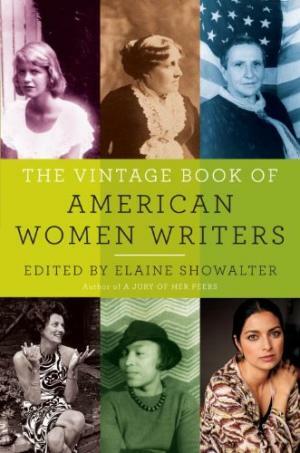 The Vintage Book of American Women Writers makes note of the struggle women have fought in order for their voices to be heard within the literary world. Of course, many people are apt to argue that there are many wonderful and historically significant women writers who did not make it into the collection, but there is only room for so many in one book. In the end, this anthology successfully underscores the overlooked importance women have played in literary history.